The Federal Energy Regulatory Commission is in the final stages of gathering environmental information about the Atlantic Coast Pipeline. The debate comes down to more jobs versus the long-term effects of increased gas drilling. Concerns about safety and damage to the environment were pitted against a desire for economic development and energy independence during a meeting at Bridgeport High School earlier this week. Eighteen people spoke in favor of the proposed Atlantic Coast Pipeline project. Fourteen spoke against it. Safety was on Tom Bond’s mind. The pipeline’s proposed route is about a mile south of his property in Lewis County. “What concerns me about this is that local fire departments are not equipped to take care of a hazard like this,” Bond said. 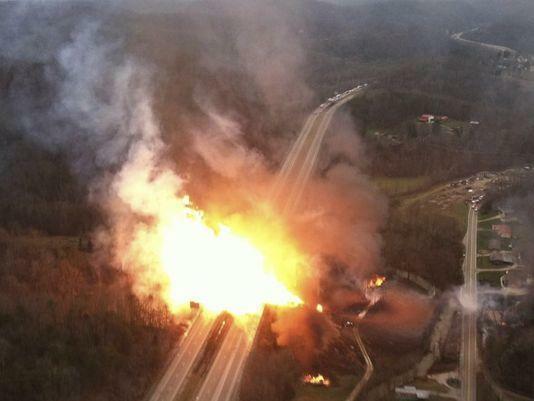 The Atlantic Coast Pipeline, or ACP, would be 42 inches in diameter, carrying 1.5 billion cubic feet of gas per day. Bond says pipelines that big are fairly new in the U.S. Because the ACP will operate at up to 1,440 psi while carrying such a large volume of gas, he says the potential for disaster, should there be an explosion, is not being properly considered. “The blast radius is supposed to be something like 1,100 feet — about a quarter of a mile. That’s what happens if there’s no ignition. If there’s ignition, then the singe radius goes out to about a mile,” Bond said. Another Lewis County landowner offered a different point of view about safety. David Layton works in the pipeline industry. He says there are more than 2 million miles of pipelines in the U.S.
Meeting attendees listen to a speaker Tuesday, March 24, at Bridgeport High School. But Layton went on to say that the infrastructure is aging and needs to be upgraded. “If these gas companies want to build new and safer pipelines to carry their product, then we should support them,” he said. A common theme of the those in favor of the pipeline was its potential positive economic impact. Many said that oil and gas development has allowed more West Virginians to get jobs and stay in the state instead of having to leave after school. Woody Thrasher started an engineering business in West Virginia 32 years ago. “On a local level, I can tell you at our company this economic development is real,” he said. He says his company, the Thrasher Group, hired 200 hundred people in the past five years. He said that wouldn’t have been possible without the oil and gas industry. “The vast majority of those people are either new graduates from West Virginia University engineering school or Fairmont University engineering school, or they’re people that worked out of state and finally had an opportunity to come back home,” Thrasher said. Several people who live in the fracking fields of Doddridge County said the jobs and energy security the pipeline would bring aren’t worth the cost. Many worried that if the projects come to fruition, there will be an exponential rise in fracking. That’s Doddridge County resident Christina Woods. On top of the ACP, Doddridge residents are concerned about another part of Dominion’s plan: The Supply Header Project. It entails building a 36-inch diameter, 39-mile pipeline from Wetzel through Doddridge and Lewis counties to Harrison County. The goal is to supply the ACP with shale gas from Ohio, Pennsylvania and West Virginia. “And now, once again, we are being asked to take on more of their risk. We as West Virginians, we deserve better. We deserve better than to be a sacrificial zone for the profit of the extractive industries,” Woods said. The ACP and Supply Header projects are still in the the pre-filing stage of development. FERC Environmental Project Manager Kevin Bowman ran the meeting in Bridgeport. He’s in charge of the environmental review process. He said Tuesday’s meeting was the last chance for people to give verbal comments during the pre-filing stage of the pipeline projects, but written comments will be taken until April 28. He said once Dominion formally applies to build the lines, there will be more opportunities for people to give their input. According to the company’s own timeline, that will likely happen in late summer. The Supply Header Project's docket number is PF15-5. The Atlantic Coast Pipeline's docket number is PF15-6. • Go to https://ferconline.ferc.gov/ and click on “e-Comment." The U.S. Forest Service is issuing a permit to survey a 12.6-mile segment of the George Washington National Forest for the proposed Atlantic Coast Pipeline in Highland and Augusta counties, in Virginia.